When the American-Canadian Tour showed up to Lee USA Speedway in Lee, New Hampshire last April, Willamstown, Vermont’s Jimmy Hebert was simply hoping to qualify for the event. 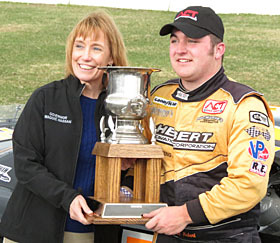 After failing to qualify for the Governor’s Cup 150 during his rookie season, Hebert went into the event thinking that a top-10 finish would be considered a success. Instead, the second-year driver went on to steal the show and win the event in dominating fashion. Nobody expected Hebert to bring home the checkered flag on that cold, spring day in New Hampshire. Not even Hebert himself. That win at Lee would end up being exactly what Hebert and his team needed to build momentum for the rest of the season. 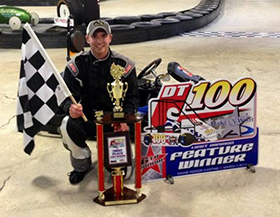 The Willamstown, Vermont driver would go on to win his second career ACT feature at Sanair Super Speedway in August. Those two victories mixed in with a number of solid finishes throughout the season would put Hebert third in the championship standing behind Wayne Helliwell, Jr. and Joey Polewarczyk, Jr. at the end of the season. Hebert now hopes to use that momentum and confidence he gained in 2013 to make another run at an ACT championship in 2014. When Hebert and his team pull into Lee USA Speedway in April, he understands the importance of getting the season started on the right note. To kill time until the start of the 2014 season, Hebert is busy racing RC cars at a local R/C track in Barre, Vermont. Although Hebert considers it a hobby, he’s hoping the quick reaction time needed to race R/C cars helps him when he pilots his full-bodied stock car on the race track this season. 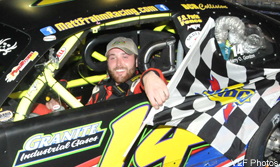 North Salem, New Hampshire’s Matt Frahm has been up and down the East Coast throughout his career competing in multiple touring series including the NASCAR Nationwide Series and NASCAR K&N Pro Series East. In 2014, Frahm and his family-owned Super Late Model team made up of volunteers will attempt to lock down their first career touring series championship when they compete full-time with the Granite State Pro Stock Series. Frahm also plans to run select PASS North races, if the circumstances are right. The 23-year-old driver is currently the winningest driver in Granite State Pro Stock Series history, but the pieces have yet to fall into place for Frahm to win the series championship. In 2013, Frahm thought he was on the right path to a championship until a string of bad luck including a blown motor and other uncontrollable events set the team back during the final events of the year. Frahm and the Granite State Pro Stock Series will begin their 2014 campaign at the Icebreaker on April 5-6 at Thompson International Speedway. Short track drivers and fans from all over the east coast battled it out on the road course at Maine Indoor Karting on Saturday afternoon to raise money for Make-A-Wish. At the end of the day, three feature winners were crowned in the different tiers racing that day but the real winner ended up being the Make-A-Wish foundation. Event organizer and founder Dave Thomas, Jr. announced on the event’s Facebook page on Monday that the event’s net fundraising was over $29,000 and counting. In order to race in the event, drivers needed to reach a certain fundraising goal before getting their shot to qualify for the race. In addition to the fundraising goals, money was also raised through raffles, ticket sales, and merchandise sales. Kyle Treadwell (Lightweight), Connor McDougal (Middleweight), Mike Horn (Heavyweight), and Dave Thomas, Jr. (Staff Race) were feature winners on Saturday. Tiffany Payne (Top Fundraiser), TJ Laro (Dave Thomas Memorial Award), and Bryon Callen (Ray Gregory Memorial Award) also received awards during the prerace ceremonies. A complete replay of the event can be found on Speed51.com by visiting our Trackside Now coverage of the event. As the Northeast Mini Stock Tour gears up for their biggest season yet, they have made another exciting announcement for drivers of the series. Starting with the series’ first event of the season on April 19, drivers will be able to pick up their payouts the day of the event following the completion of post-race technical inspection. Jimmy Hebert will look to get back to victory lane when the ACT Tour gets ramped up in a few weeks. Matt Frahm hopes to make the races wins translate to a title in 2014 on the GSPSS. Kyle Treadwell won the "Lightweight" feature during the DT100 last weekend, which raised more than $29,000 for Make-A-Wish.